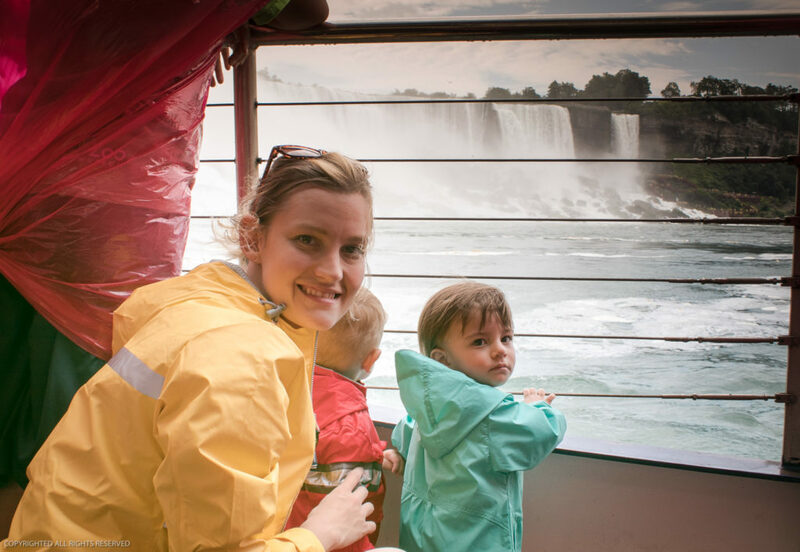 Visiting Niagara with twin toddlers. 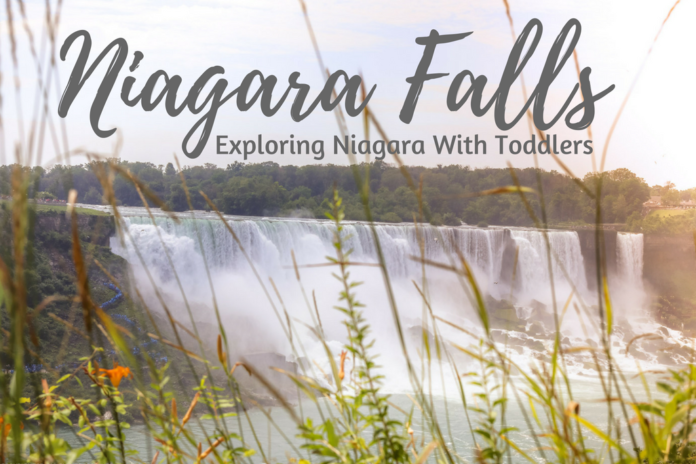 We recently had a blast exploring Niagara Falls with our two high energy toddlers. It’s such a great destination for families because there’s something to appeal to every age group. Children under 6 years old are free practically everywhere and it’s mostly all stroller and wheelchair accessible. You spend anywhere from one day to a whole week in Niagara Falls with kids. 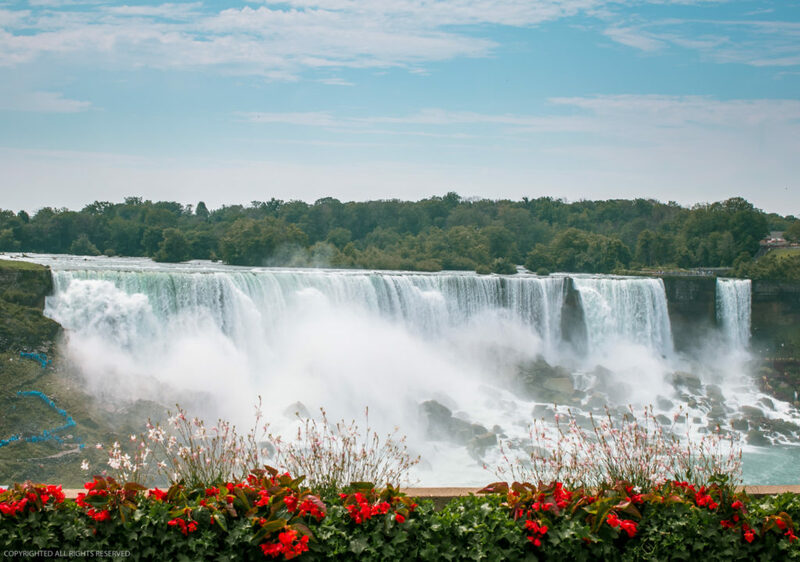 I have been to both the American and Canadian sides of Niagara Falls and if you’re making the trip, you’ve got visit the Canadian side if feasible. Not only is it where you find the best view of Niagara Falls, it’s also much more developed and tourist and kid-friendly. 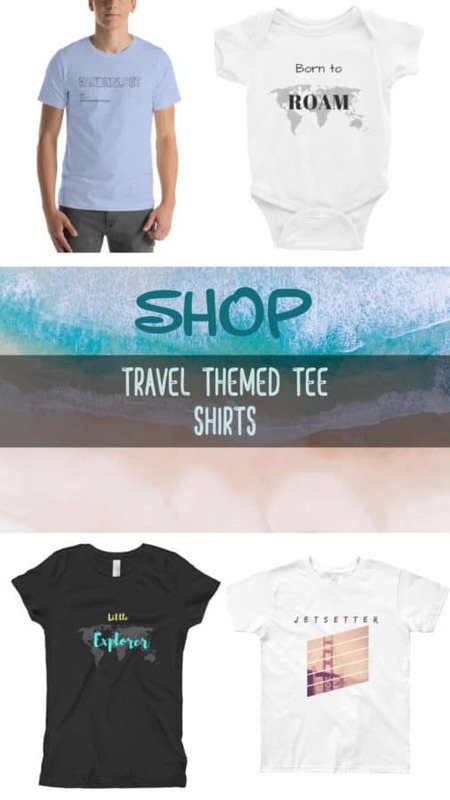 There is plenty to keep your little ones happy during the trip. Check out adventures such as zip lining, adventure courses, botanical gardens, the aquarium, Clifton Hill, The Old Fort, golfing or indoor waterparks and more! Our weekend visit meant after travel time, we had a day and a half for activities. 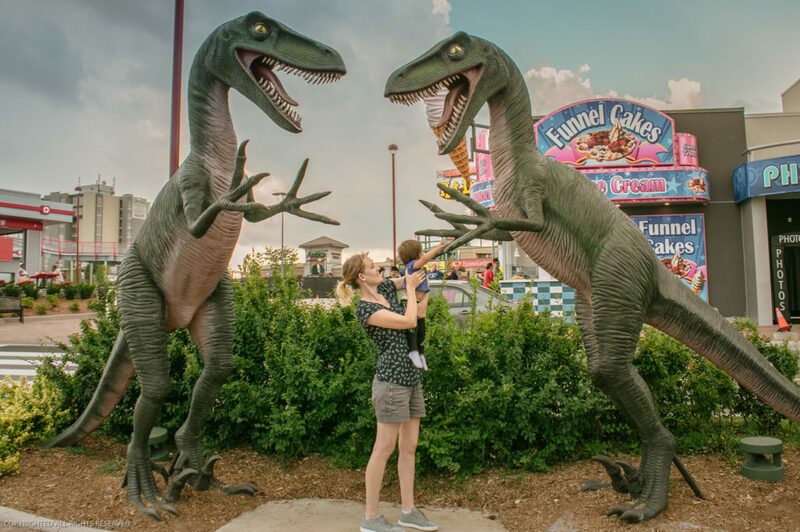 I have to account for naps and other potential delays when traveling with 2 toddlers so I usually choose 1-2 major attractions a day and wing the rest. My online research before our trip told me that the best attraction for all age groups was the Hornblower Cruise and that one of the best attractions for small children was the Butterfly Conservatory so those were my 2 must-do activities. 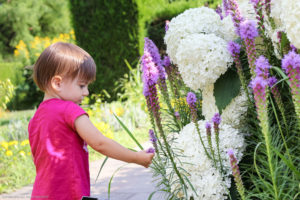 Since we had a long drive up, I wanted my kids to be able to run around on the first half day so we started with the Niagara Botanical Gardens. 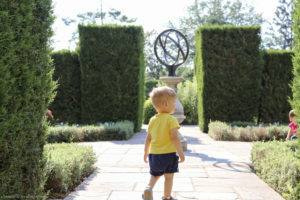 Niagara’s Botanical Garden is the perfect antidote to the touristy hustle and bustle of Clifton Street. The gardens are vast, spanning 99 acres (40 hectares). Its a great place for kids to run around, smell the roses (literally if the seasons right) and learn about different plant species. The gardens are well manicured and all the plants are labeled for teaching opportunities. I saw a deer roaming freely under some large pine trees. I have no idea if that’s typical or if I just got lucky but keep an eye out. The Botanical Gardens are free. Parking is available on-site for $5.00. The WEGO (tourism bus line) also stops inside the gardens. 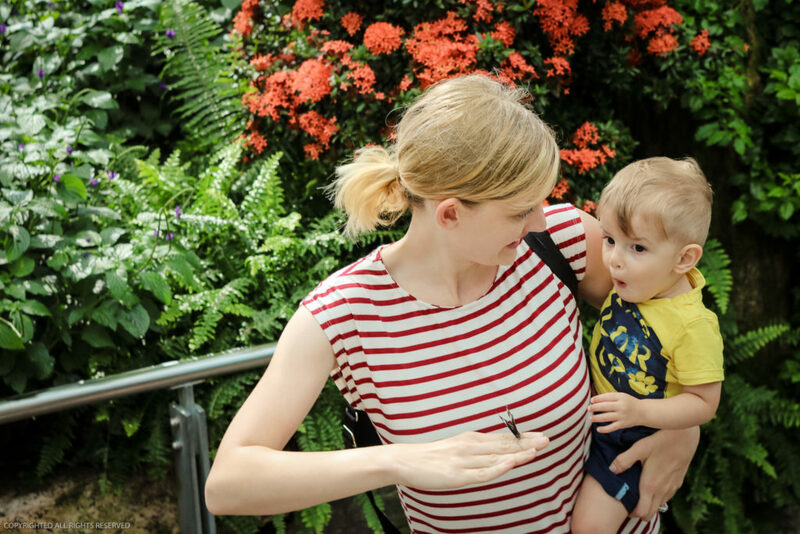 Inside the Botanical Garden, you’ll find the Butterfly Conservatory. It was a pretty magical experience for my toddlers. Bigger kids, with a bit of luck, had butterfly’s land in their hands. All the advice I read prior to our visit said to wear bright colors so butterflies would be more likely to land on your clothing. I noticed more butterflies landing on green clothing, which made sense because the plants were mostly green. My husband didn’t want butterflies to land on him so he wore a dark green shirt, at least 2 landed on him. So my advice would be to wear green or bright colors. There’s an informative video at the beginning before you go in, I actually learned a lot and my toddlers seemed to enjoy it. A lot of people left in the middle though so if you had to move with a fussy baby you could skip it. 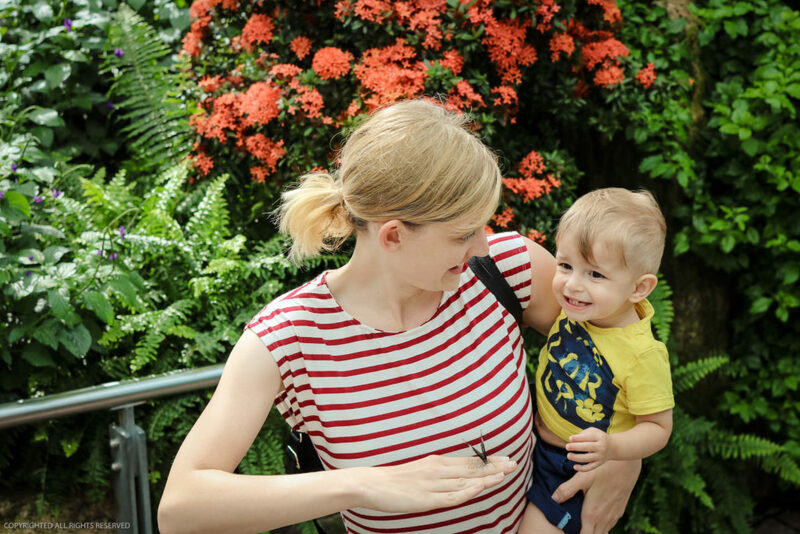 Strollers are permitted inside the conservatory but the paths are narrow and crowded we opted to leave our double umbrella stroller in the designated stroller area. We made our way to the Hornblower Cruise, by that time it was about 11 am. The line was not long, maybe 10 minutes or so, but it took about 10 minutes more to walk down to the launching area. While most people migrated towards the front of the boat for the most dramatic experience -something I think older kids would love. We went to the rear side of the boat. There were some large gaps on the bottom railing, so we found a spot without. My kids stood and held onto the railing. I crouched down behind them ensuring they kept their balance. What began as a light mist become a torrential downpour as we went close to the falls. When the water became more intense my husband took one of our kids inside. “Inside” is like 4 steps away so don’t feel like you have to commit at the beginning of the boat ride. The cruise was the best thing we did, all 4 of us really enjoyed it. Tips, Tricks & Logistics: Lines can be long especially during the summer, get there early to avoid a long wait. Bring a change of clothes if you don’t want to walk all the way back to your car and/or bring your own rain gear. The kid’s sized ponchos won’t fit toddlers or small children well. The neck hole was more like an entire body hole. Wearing something other than a bright red poncho will also make your photos significantly better if you’re bringing a camera onboard. You’ll stand out within the sea of ponchos and really those are flattering on no one. Non-skid shoes are a must, the whole boat gets drenched. Ticketing: Tickets can be purchased online. You do not need to print anything off, just show the QR code at the gate. Children 4 and under are free. There is no age or height requirement for Hornblower Cruises. The boats are modern catamarans and the ride is out is pretty smooth. I don’t recommend holding your baby or small child while standing near the railing for safety reasons. You can take a stroller on-board but you have to keep it in the inside viewing area and your child must be strapped in the entire time. If that doesn’t sound like fun at all, there is stroller parking right before you board the boat. I do recommend taking your stroller up to that point because there is a lot of walking and large crowds. Baby carriers are another good option onboard. The line was long to leave the cruise than it was to board, just something to keep in mind when scheduling around meals and naps. Back at the viewing area up top, we stopped at a no-frills burger place because I was famished and it was the first place I saw. The food was decent but the views were incredible. There are many restaurants on Niagara Parkway for different budgets with really great views. I was pretty happy I crossed dinner off at the post Skyline tower at that point. There are plenty of food options on Clifton Hill as well. Many families enjoy the rainforest cafe. We skipped it because it was a 1.5-hour wait, you actually had to wait in the line too, you couldn’t just put your name down. Other popular and well-reviewed options are the hard rock cafe, Kelsey’s, Fallsview Buffet Restaurant, Boston Pizza and Antica Pizzeria and Ristorante. There is no shortage of food options when visiting Niagara falls with kids. Clifton Hill is one big, colorful tourist trap (not that I was complaining). It reminded me of a mini-Vegas geared toward kids. Expect inflated prices but lots of fun options for children. After spending some time playing in the arcade, we went through the Mystic Mirror Maze. At one point, my daughter got really excited and ran right into a mirror. She was totally fine but after that, she learned her lesson and stopped in tracks if I said the word “careful.” The mirror maze was surprisingly big inside, I recommend it. We went into the “Fun House” which was not so fun. It was claustrophobic inside and not well maintained – skip it. We also went to the Guinness world record museum which was boring – skip it. Wanting to do one last attraction before heading out, we saw the Sky Wheel right next to us. I usually dislike Ferris wheels but this was an “observation wheel.” The cabins were fully enclosed, climate controlled, seemed safe. So we waited in line for at least 25 minutes and finally, it was our turn. After I sat down, I saw a sign on the door said: “do not push on the door” with an image of the doors opening. In my head, that meant if my child touched the door they would fling open and we would all fall to our deaths. Can you tell I’m not great with heights? The wheel went around about 5 times. I spent the first 3 rounds freaking about the height and the doors. By the last 2, I was over it and really did enjoy the views. 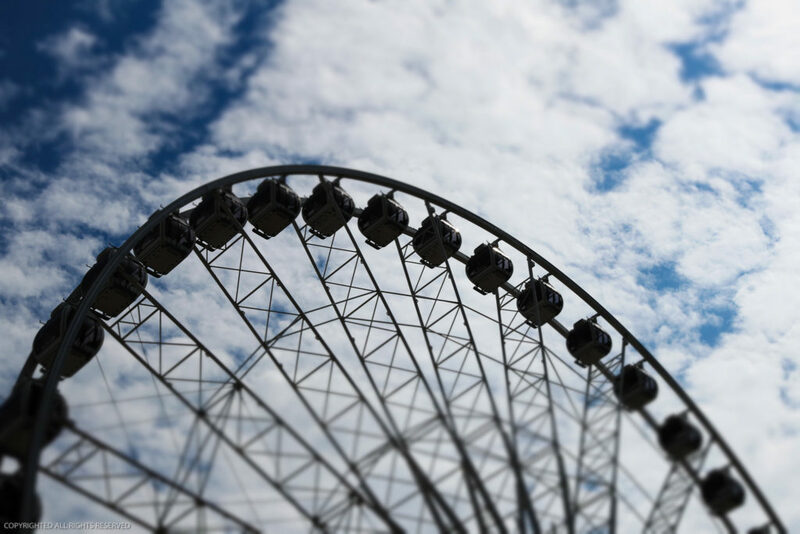 Overall, between the price, the wait and the views being similar to many of the restaurants in the area I would say skip it unless observation wheels are your jam, then you’ll probably love it. Tips, Tricks & Logistics: Keep to one side of the border as much as possible. What used to be a fast and easy border crossing has become much more rigorous and time-consuming in recent years for Americans entering Canada. Be sure to view the falls at night. They are beautifully lit and often festive green for earth day, red for valentines, etc. Most nights at 10 pm there is a firework display over the falls. Most of the restaurants around the falls feature convenience food such as pizza, burgers, and fries. Home-packed snacks will help your kids get their fruits and veggies in on the go. Secure parking is recommended for whole Clifton Hill area. We parked at Clifton Hill which was very convenient. WEGO is another option. The next day we had Clifton Hill and the Hornblower cruise scheduled. We planned to spend some time just to admire the falls from the viewing areas as well. I know a lot of people like to save the best for last but we typically do the opposite with kids. This ensures we actually get to the top attractions and it helps us avoid long lines. After a leisurely breakfast, we walked right past all the Clifton Hill attractions to the falls viewing area. Bring your camera because this is a great place to take in the view and snap a few photos. 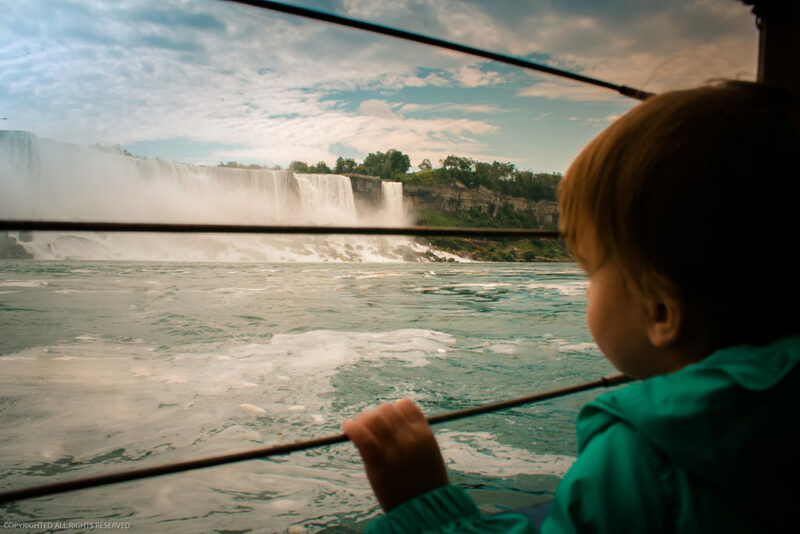 My kids were instantly fascinated – their interest in the falls didn’t waver throughout the day either. 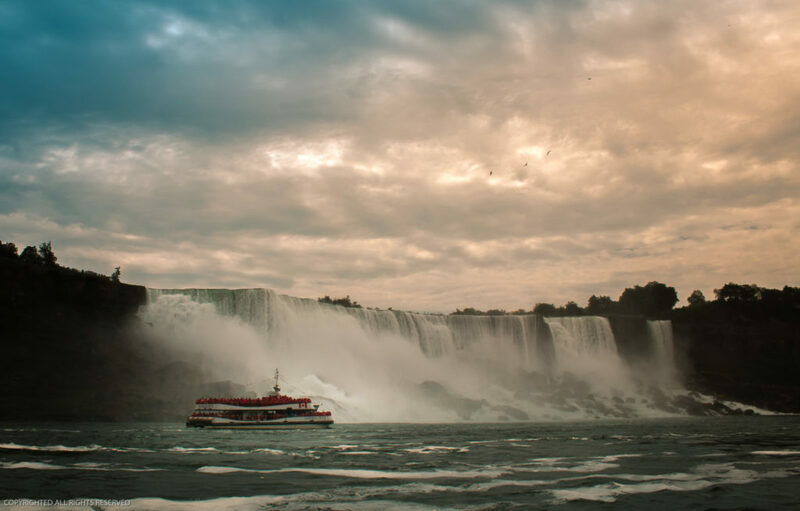 The other best view of Niagara Falls is from on the water aboard a boat. Other great options are from Journey Behind the Falls and the White Water Walk. Discount packages are available at Niagara Parks but the discount only adds up if you do all of the attractions within the package. Otherwise, it’s best to purchase tickets separately. It was a fun packed weekend for us all. My littles fell right to sleep when we got back to our hotel. I’m already planning our next trip to Niagara Falls. The kids will be a bit older so we’ll add the Journey Behind the Falls, the White Water Walk and maybe an indoor waterpark.